As a medieval historian I have always been somewhat perplexed by the effigies in the Temple Church in London. Looking at them over the years has raised questions in my mind as to the accuracy of their identification; therefore I began to research the history of the effigies and their identities by beginning with the earliest records. Sometime in 1160 or 1161 the original administrative centre of the Templars in England was transferred from their house at Holborn to the more convenient and spacious quarters on the north bank of the Thames. In 1185 the new Temple Church was dedicated and consecrated by Heraclius, the patriarch of Jerusalem, and later re-dedicated in 1240 when the new chancel was built. During the Wat Tyler rebellion of 1381 the effigies were probably damaged and the records of their specific identities and history were destroyed. According to both Richardson and Bellot, Gerald Leigh noted in 1576 that the coats-of-arms were painted upon the shields of the effigies. The greatest problem in determining the true identity of each effigy is the fact that few, if any, records exist of what was done architecturally in the Temple between the twelve-hundreds and sixteen-hundreds. This leaves a lacuna of more than four hundred years of documentation with regard to changes and alterations within the Temple. Prior to 1598 Williamson says that the effigy figures had been moved from their then current positions and moved again in 1682 or 1695. In 1685 the Temple was repaired, and a Corinthian screen with a reredos was placed at the east end. A fire in 1695 destroyed parts of the southwestern side of the church; in the same year the north and east end of the chapel were repaired, and it was apparently at this time that the stone with the inscription of the dedication by Heraclius was lost. There was a general restoration in 1811, and in 1824 the round was almost completely rebuilt with the old carvings being destroyed. The ten years between 1830 and 1840 saw another restoration based upon the concept of Gothic revival which Loftie calls 'the great vandalism.' The floor was raised and the central part of the church was vaulted. All the old marble columns were removed and replaced with new ones of Purbeck marble. The old wainscot and reredos were replaced with tiers of pews and a Gothic style reredos. All the monuments with their heraldry were gutted. During this restoration and the accompanying excavation process, the restorers discovered beneath the effigies two stone coffins and five leaden ones which had been enclosed in small vaults. The skeletons were complete in two cases; one was found to be six feet and four inches in length and the other six feet and two inches. All these remains were placed in a shed outside the church while the repairs to the foundation of the Round were made. They apparently became an exhibit visited by thousands of people before the display was closed. Due to such exposure to light and air, the remains crumbled and turned into dust. The remains were then combined and placed into a vaulted grave which had been dug in the reconstructed Round. Thus not one of the current effigies marks the actual resting place of the knight for whom it was made. The extant written records of the effigies begin with Camden's Britannia first published in 1586; he noted that many effigies of cross-legged noblemen lie in the Temple Church. He wrote that among those effigies were William Marshal and his sons, William the younger and Gilbert. In his Survey of London published in 1598, Stowe wrote of eleven monuments of noblemen within the Round. He stated that there were eight images of armed knights; five of the effigies were cross-legged and three were straight-legged. Dugdale in Originies Juridiciales published in 1666 described the effigies as eight in military habits with large and deep shields on their left arms. He stated that one of the effigies had a large lion rampant engraved upon its shield. Note that Dugdale mentions only eight effigies while Stowe mentions eleven. Stowe wrote that the first of the cross-legged knights was William Marshal the elder, but in 1842 an additional figure seems to have been brought into the Round and now appears as the first effigy on the floor. The original position of the effigies may have been altered either during the year of 1682 when the church was thoroughly repaired or in 1695 when the ornamental screen was placed inside according to Addison. Unfortunately there are no records that indicate whether the effigies had been altered prior to the sixteen-hundreds. Apparently in 1696, Roger Gillingham, treasurer of the Middle Temple, was given credit for facing the Temple with New Portland stone and with positioning the effigies in a uniform order within a grate of iron in the middle of the Round. Bellot writes that early in the 1700s, prior to 1736, the effigies were repaired and painted and the east and west walls were restored. The Temple Church escaped most of the fire damage that occurred in the fires of London in 1666 and 1678, but on 10 May 1941, it was badly damaged by incendiary bombs dropped during the German Luftwaffe blitz. Due to the bombs and the resulting fires, the Temple and the effigies within the Round suffered extensive injuries. The repair work began in 1948 and was completed in 1958 when the Temple Church was re-dedicated by the Archbishop of Canterbury on 7 November. Several points must be made before beginning this discussion of the identities of the Temple effigies. First, I have found no extant primary source which clearly states that effigies which had crossed legs were categorically identified as men who had taken the Crusader's vow and actually gone as crusaders to the Holy Land. This seems to be an assumption which somehow gained popularity long after the actual time period of the creation of the sculpted effigies. In the case of William Marshal the younger it is patently untrue since he never took the Crusader's vow or went on Crusade. Gilbert Marshal apparently took the Crusader's vow in 1239, but was prevented from ever going on crusade by being recalled to the king's favor by King Henry III in 1240. Gilbert was then killed in a tournament at Ware in 1241 and buried in the Temple Church. Edward Prior and Arthur Gardner provide a thorough discussion of the history and methods of the creation of effigies which clearly illuminates the style of these figures. The crossed-legs of some figures according to them are more a question of artistic rendering than of documentation that the person represented was an actual crusader. Second, H. A. Tummers states that there are no non-ecclesiastical effigies in England prior to 1200 and that none of the effigies except those of Queen Eleanor and Henry III have any documentary evidence whatsoever as to their specific identity. Richardson in his work on the restoration of the effigies in the Temple Church between 1840 and 1842 catalogs some of the prior repair work which had been done to these effigies. However, there are no surviving records documenting how many times restoration work was done between the twelve-hundreds and the late sixteen-hundreds or any records of what had actually been altered or repaired. Third, the specific identification of the effigies in the Temple Church is somewhat questionable. Loftie points out that the identities of the effigies were always subject to much futile conjecture, especially during the time of their restoration in the early eighteen-forties. Tummers and Loftie both point out that the date of death of a person does not necessarily coincide with the creation of his effigy. The effigies could have been completed at any time from one to several years after the actual death of the person for whom they were carved. According to Loftie it is possible that not more than ten years separates the oldest effigy in the Temple from the latest based upon the finished product. Therefore, the actual identity of any given effigy must rest upon the available extant records and documents not upon the date of death of an individual. Previously two effigies from the Temple Church have been assumed to be identified by the supposed armorial bearings upon their shields. The first one, Richardson's plate three, has been identified as Geoffrey de Mandeville, first earl of Essex. He died in 1144, and his body was first held within the precincts of the old Temple but not buried as he had been excommunicated at the time of his death. He was later buried in 1163 at the portico of the west door in the consecrated churchyard of the new Temple, after he was absolved of his excommunication by the pope. Park argues that de Mandeville was buried in the west porch of the new Temple because no one was buried inside until after the end of the twelfth century. He also argues that de Mandeville was a founder of the Temple in London and that his burial in the west porch was a privileged location for such a man. Lankester writes that this effigy cannot be identified as de Mandeville because the designs on the shield are not the accepted heraldic arms of the de Mandeville family, and there are no other recognized authorities for attaching this identity to the effigy. The other effigy identified by his arms carries a shield charged with three water bougets which were the arms of the de Ros family. This effigy was not placed in the Temple Church until the late seventeenth century. Using the images from Richardson's folio, which seem to be the clearest and most detailed versions of the effigies, I have sought to resolve the possible identification of the effigies currently labeled as members of the Marshal family. 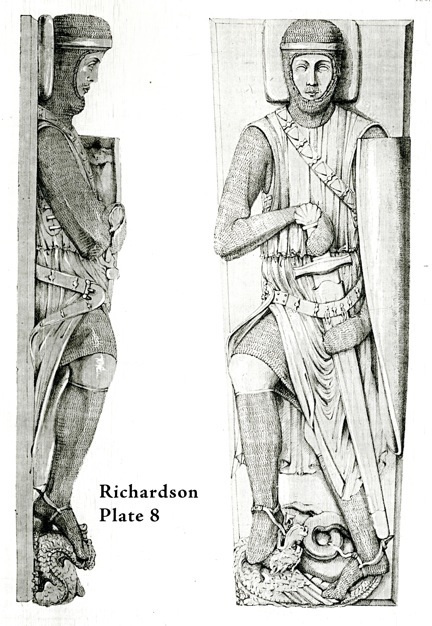 The first effigy identified as William Marshal the elder is seen on Richardson's plate six. The justification for this image's identity seems to rest upon Richardson's own work and his interpretation of Stothard's work on monumental effigies in 1817. Stothard had written that he doubted that there had been an inscription on any of the effigies. This contradicts Camden's record of 1586 which he stated that on one of the cross-legged effigies were the words, "Comes Pembrochiae Miles eram Martis Mars multos vicerat armis." Richardson's solution to this contradiction rests upon his discovery of something which seemed to be a copper fastening found on the effigy in plate six. He assumes that this could have been the means of securing a plaque which carried the inscription described by Camden. There is no way to know when this copper fastening might have been attached to the effigy, or if it originally even belonged to this particular effigy. The assumption that Richardson's plate six is William Marshal raises serious questions. Both Crossley's (1868) and the Hollis brothers' (1840) work label this knight as simply a Knight Templar; it is not identified as William Marshal the elder. Considering the time period and the usual practice of such burials of important people, these effigies must have been originally the lids or plates of sarcophagi or burial chests for internment under the floor of the Round, not effigies created to rest flat on the floor. There are no records of when or how these effigies were removed or how they were structurally altered. It is not known what had to be removed or altered to allow for such a different position of the effigies. This brings us to the effigy currently identified as William Marshal the younger which is seen on Richardson's plate seven. The identification is based upon the arms on his shield and by records which state that William senior, William the younger, and Gilbert Marshal were all buried within the Temple Church. However, the crucial question with regard to the effigy's identity is whether or not the two sons, William the younger and Gilbert, were ever represented by effigies in the Temple Church. There are no extant records that prove that either of these two men was among the Temple effigies, nor in fact is there any extant primary source that states that William Marshal the elder was among them. From Camden's time through the time of Gillingham and Stowe, the effigy who was the first cross-legged knight effigy was recognized as that of William Marshal the elder. Richardson believed the face of the effigy seen on plate seven was too young to be William Marshal senior. Park argues that he believes Richardson's plate six might be Marshal the elder because the face is definitely depicted as older and lined. However this assumption also has inherent problems; both William the younger and Gilbert Marshal were well into their forties when they died which was old for their time period. Tummers in his work disputes this assumption by writing that the face and attitude of the effigies were sculpted to portray a man in the full vigor of his life, not at his death. Of all of the Marshals it seems more reasonable that Marshal the elder would have been portrayed in the fullness of his life rather than as he appeared at his death. To the Knights' Templar, it was Marshal the elder's prowess and successes on the fields of battle that would have been of greater importance than his age. Added to Tummers' work is the evidence of both Loftie, writing in 1895, and John Foster, writing in 1902, who clearly label in the drawings in their books that this effigy is in fact William Marshal the elder, not William the younger. The effigy on plate seven was described by Richardson during his restoration as wearing a chain mail coif and a hauberk of chain mail to his knees. However, he is wearing what appears to be chausses of leather or some reinforced material from his waist to just below his knees. Lankester describes this covering as possibly gamboised cuisses which were quilted tube-like padded armour worn to protect the thighs, but they are shown without the covering of full chain mail which would have been the usual practice. From just below the knee he is wearing chain mail which continues down to encase his feet. This same type of armour is seen on the effigy of Robert Curthose in Gloucester Cathedral. 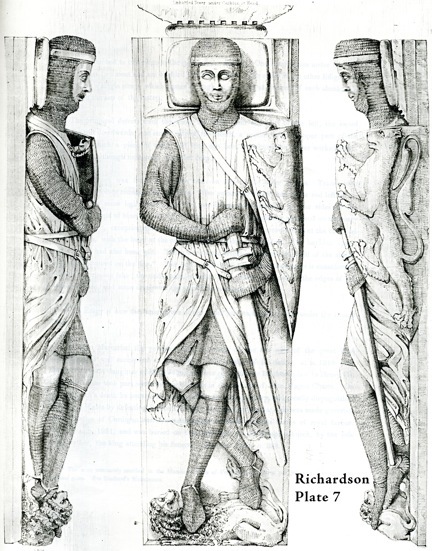 The effigy on Richardson's plate seven is wearing the mitten-like chain mail gloves on his hands instead of the individually fingered mail of a later period as seen on Richardson's plate six. His legs are crossed, and his feet are armed with spurs and resting upon a lion couchant. Over his armour he wears a loose garment which is held at his waist by a girdle. On his left arm hangs a shield with a lion rampant engraved upon it. Note that the guard on his sword is relatively small, not as wide as most of the visible guards on the other effigies. This smaller type of guard is also seen on the seals of Robert fitz Walter and Richard I which would seem to denote an earlier time period rather than a later one. Richardson states that he discovered traces of paint on this effigy including red on the field of the shield but not on the lion. The coat-of-arms ascribed to Marshal are per pale or, vert, lion rampant gules which means the lion should be red and not the field. However, Bellot wrote that the effigies were painted in the early seventeen-hundreds, and this would account for the paint Richardson found on some of the effigies as well as the possibility that they were painted incorrectly. If Richardson is correct about the chausses, which one could assume considering his close personal involvement in the restoration of these effigies, then the current identification seems to be an anomaly. 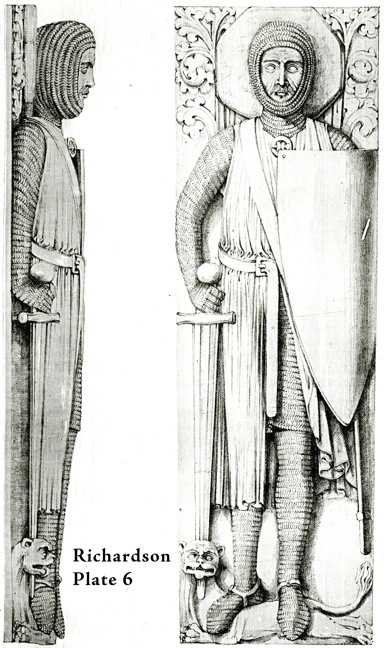 If one presumes that all three men of the Marshal family are among the existing effigies in the Temple Church, and one knows that the development of a knight's armour was a forward progression and not backward, then it is a complete contradiction to have the son in an older style of armour than the father. Look at the attire of the knight on plate six; he is covered from head to toe in chain mail, and his hands are covered with individually fingered mail. Note that the guard on his sword is much wider than the guard seen on the sword on plate seven. This would indicate a knight's attire of a later time than the knight on plate seven. Though Tummers argues that the dress of any effigy should not be a determining factor in identifying a secular image, I believe that with the Temple effigies much more care would have been given to the military attire than to the dress of effigies in a strictly ecclesiastical edifice. The Knights' Templar were first and foremost a military organization answering only to the pope, and correct military attire on a tomb effigy honouring a knight would have been considered important. An additional historical fact often ignored is that the Temple Church was primarily for members of the Templar order; it was not a church for the general public. Perhaps the most important factor not addressed by most of those who have written about the Temple effigies is the fact that William Marshal the elder was not just a generous benefactor to the Knights' Templar; he was also an associate Knight Templar who fought in the Holy Land for two years and died under the mantle of the Templars in 1219. Also of significance is the fact that Marshal was a close friend of the Master of the Temple, Aimery de St Maur, and according to the chanson de geste Marshal was buried next to Aimery before the altar in the Temple. Park explains that Marshal's actual burial place would have been between the nave and the choir and in front of the rood in the nave. Since William Marshal the younger was present at the burial of his father, it is logical to assume that the chanson de geste created by his commission would be an accurate record of where William Marshal the elder was buried within the Temple. The effigy seen on plate eight is also identified as a Marshal. He carries a plaque identifying him as Gilbert, Marshal's third son, who died in 1241. He is depicted as a cross-legged knight in the act of drawing his sword from his left side while trampling upon a dragon, the symbol of evil. His attire is very similar to that of the knight in plate seven; again he is wearing chausses of some material from his waist to his knees with chain mail from below his knees down to his feet. Note that the pommel on his sword is a scallop shell. This is an unusual design and presents an interesting possibility with regard to the identity of this particular effigy. In this time period a scallop shell was the badge given to those who made the pilgrimage to St James de Compostela, but the scallop shell was also found in coats-of-arms. Looking at the earliest rolls of arms in search of coats-of-arms that carried scallop shells, I discovered several intriguing facts. In Glover's Rolls, which are accorded the earliest date, there is the depiction of the coat-of-arms of Ralph de Bigod. The arms are blazoned as or on a cross gules five escallops argent. There are two Ralph Bigods from the twelve-hundreds. The first Ralph was the son of Roger II (d1221), third earl of Norfolk, and brother to Hugh II. The second Ralph was the son of Hugh II (d1225), fourth earl of Norfolk, and Maud Marshal (d1247/48). The coat-of-arms of the Bigods, earls of Norfolk, was or a cross gules until 1245 when Roger Bigod, Maud Marshal's son, succeeded to the office of marshal of England. Also depicted in Glover's Roll of Arms are four other arms that carry scallops. Those of Herbert and Martin Chamberlain are identical; they are blazoned as gules trois escallops or. The Chamberlains were counted among the early patrons and supporters of the Knights' Templar. Another coat-of-arms is that of Ralph fitz Nichol, blazoned as gules semy escallops argent a cinquefoil or. The last coat-of-arms belongs to Ellis de Rabayne, an active baron of Henry III; his arms are blazoned as argent a fess between trois escallops gules. In the later rolls of arms of the twelve-hundreds there are even more individual arms which carry scallops. Considering the unique feature of a sword with a scallop shell pommel, perhaps this particular effigy deserves further investigation as to its identity. I have found no record that states that Gilbert Marshal made a pilgrimage to St James de Compostela, or that a scallop shell was any part of his coat-of-arms. There are no known primary sources that state that either of Marshal's sons became an associate Knight Templar. The note in Matthew Paris that William the younger was an associate Knight Templar must be viewed with extreme caution as no other primary source verifies this. I have found no record that William the younger took the Crusader's vow, and he definitely did not go on crusade. Gilbert took the Crusader's vow, but never went on crusade. Both sons are recorded as having being buried near their father in the Temple, but there is no record of their being buried in a tomb or sarcophagus on the floor of the Round. The identity of two effigies as William Marshal senior's two sons is at best uncertain. John the marshal, William the elder's father, gave the Templars his lands at Rockley near Marlborough in Wiltshire c 1155/56. Temple Rockley became the Templars' chief set in Wiltshire. Though no record exists which shows William the elder's confirmation of his father's charter, it is reasonable to assume that he did. Gilbert de Clare, grandfather to Isabel de Clare, William's wife, gave the Templars extensive lands between 1138 and 1148 at Weston and Baldock in Hertfordshire and at Radwell in Bedfordshire. There exists a copy of William Marshal the elder's confirmation of de Clare's charter with an extension of that gift which included the church of Weston with its purtenances in wood and plain, ten librates of land in Weston manor, the wood called Langenache, and the mill and miller of Radwell. William Marshal the younger confirmed the original gifts of Gilbert de Clare (d1148) and his father's prior gifts to the Knights' Templar and added a few. The extant records do not provide sufficient proof that either of Marshal's sons was so significant to the Knights' Templar as to warrant their being among the few effigies within the Temple Church. There are no extant primary sources contemporary with the effigies which state their identity. If none of the effigies is either William the younger or Gilbert Marshal, then only one effigy could be identified by its arms as William Marshal the elder. Marshal the elder was a Crusader, fought as a Knight Templar, and died as an associate Templar. He was a dominant figure on both the national and international stage for almost fifty years. If the embattlements above the head of the effigy on plate seven signify castles, both baronial and royal, held by the individual portrayed, then William the elder held more of both than any of his sons. William the elder held extensive castles as marshal of England, earl of Pembroke, lord of Chepstow, Leinster, and Longueville in right of his wife, and as regent of England from 1216-1219. Perhaps another intriguing addition to this puzzle is that while Marshal the elder was buried next to Aimery de St Maur before the altar in the Round according to the chanson de geste, there is no mention of an elaborate tomb or sarcophagus. Is it not more probable that both men were buried in a vault beneath the original floor of the Round since Aimery, as Master of the Temple, would not have been buried in any type of elaborate tomb? If both William the younger and Gilbert were buried near their father, again with no mention of a tomb or sarcophagus, is it not also probable that they were buried in vaults beneath the floor? I take strong exception to Park's statement that William Marshal the elder died excommunicate. This idea is incongruous, especially considering the peripatetic journeys of the excommunicated body of William de Mandeville before he was absolved and allowed burial in the west porch of the Temple. First: Marshal could not have been buried in the Temple Church and buried by Stephen Langton, Archbishop of Canterbury, had he been excommunicated. Second: According to the Calendar of Documents Relating to Ireland, in April 1218 the king prohibited Henry Archbishop of Dublin, the archbishop of Tuam, and the bishop of Clougher from hearing the plea of the bishop of Ferns while the king was underage (Henry III did not gain his full majority until 1227) since it was a lay fee which Marshal held as a tenant-in-chief of the king. On April 20, 1218, a mandate was issued to the justiciar of Ireland to bind over all parties to appear before the king and show cause of why they had held pleas regarding this lay fee in the ecclesiastical court. Fourth: In May 1218 at the request of the king in recognition of his services, an indult was sent to William Marshal from Honorius III giving him the right not to be held responsible to anyone else as long as he was willing to do justice regarding complaints before the lord of fee (Henry III) about things held in fee by him and see that the king's rights were maintained intact in all cases. Fifth: The apocryphal tale from Matthew Paris explaining the death of all of Marshal's five sons without issue is supposedly written with regard to the 1240 consecration of the new chancel of the Temple Church. This is the source for Park's assertion that Marshal died excommunicate. Since the last of Marshal's sons did not die until December of 1245, this certainly calls into question the accuracy of the tale. In addition to this, no other primary source has any record of Marshal the elder being disinterred or being excommunicated. Sixth: Ailbe (Albin) O'Molloy was bishop of Ferns only until 1222, so the use of his name in Paris' tale of c1240 is long after he was bishop of Ferns. Seventh: William Marshal the elder, on his death bed, had been given the gift of plenary indulgence by the Pope "through the papal legate" according to chanson de geste written shortly after Marshal's death. It is William Marshal the elder who is much more likely to have been honoured by having his effigy placed in the Temple Church in London. William Marshal the elder was one of the most important men in his time period. He served the Angevin crown for almost fifty years, fought against the invasion of England by Louis of France, insured the re-issue of the Magna Carta and extended it to include Ireland after it was annulled by the pope under King John, and ended his life as regent for the young King Henry III. His place and prominence in history far outweighs the significance of either of his sons. Which, if any, is the possible effigy of William Marshal the elder? It seems logical to believe that Camden, the treasurer of the Middle Temple, and John Stowe had some sound basis for their belief that the first cross-legged effigy was that of William Marshal the elder. Added to their records are the works of Loftie and Foster which clearly depict the image on Richardson's plate seven as that of William Marshal the elder. When and why that image became identified as William Marshal the younger is not clear, but there seems to be enough evidence to the contrary to justify a reconsideration of its identity. There is also another possibility which needs to be considered. What if none of the effigies is actually a member of the Marshal family? Just because they were supposedly buried at or in the Temple would not guarantee that they are among the few monumental effigies. They could have been buried in the Temple churchyard or in vaults under the original floor of the round. If the red paint found on the field of the shield with the lion rampant was actually an accurate depiction of a heraldic shield, then there are several possibilities. Roger de Mowbray of Axholme carried as his coat-of-arms gules a lion rampant argent; the earls of Arundel, fitz Alan and de Aubigny, carried arms of gules a lion rampant or. Roger de Mowbray was not only a generous patron of the Knight's Templar, but also a crusader at least twice, in 1147 and 1186. William de Albini, earl of Arundel, was a crusader who fought at the siege of Damietta in 1219 and died in Italy on his way home in 1221. William fitz Alan was a generous patron of the Knights' Templar in Shropshire. Any of these three could justifiably be one of the effigies in the Round of the Temple Church. One other coat-of- arms depicted in both Glover's Rolls and the Walford Rolls is gules a lion rampant or. These arms belong to Hugh Bigod, one of the Bigod brothers, not the earl of Norfolk. Looking at just these heraldic arms should provide possible alternatives to identities for the effigy which carries a lion rampant on the shield. In the final analysis the paucity of extant records regarding the possible identities of the effigies in the Temple Church suggests a need for a re-assessment of the identity plaques currently found on the effigies and a verification of their accuracy. In light of these few facts, perhaps none of the effigies should carry identification plaques except for the de Ros effigy. Addison, Charles G. History of the Knights Templar. London: Longman, Brown, Green, and Longmans, 1842. Print. ---. The Temple Church. London: Longman, Brown, Green, and Longmans, 1843. Print. Armstrong, Catherine. 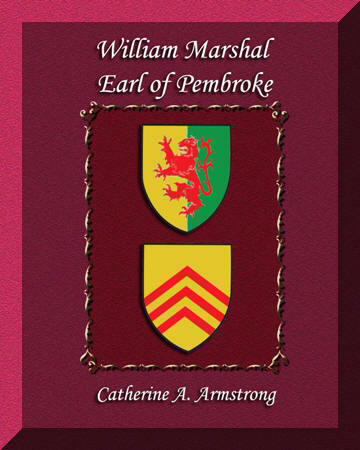 William Marshal Earl of Pembroke. Kennesaw, GA: Seneschal P, 2007. Print. Billings, R. W. Architectural Illustration and Account of the Temple Church. London: T. W. Boone, 1838. Print. Calendar of Documents Relating to Ireland. Ed. H. S. Sweetman. 3 vols. London: Longman, 1875-1886. Print. Calendar of Entries in the Papal Registers Relating to Great Britain and Ireland: Letters. Vol. I 1198-1304. Ed. W. H. Bliss. London: HMSO, 1893. Print. Camden, William. Camden's Britannia. 1695. Trans. Edmund Gibson. 2 vols. New York: Johnson Reprint Corp., 1971. Print. Chronica Majora: Matthaei Parisiensis Monach Sancti Albini. Ed. H. R. Luard. 7 vols. London: Rolls Series, 1884-89. Print. Crossley, Frederick. English Church Monuments A.D. 1150-1550. London: B. T. Batsford, 1921. Print. Dove, William. "The Temple Church and Its Restoration." Transactions of the London And Middlesex Archaeological Society (1967): 164-172. Print. Dugdale, William. Origines Juridiciales. London: G. Kearsly, 1780. Print. "Ferns." Catholic Encyclopedia: An International Work of Reference on the Constitution, Doctrine, Discipline and History of the Catholic Church. Eds. T. J Shahan, & J. J. Wynne. 1913. December 21, 2010. Foster, Joseph. Some Feudal Coats of Arms from Heraldic Rolls 1298-1419. London: Spottiswoode & Co., Ltd., 1902. Print. Godfrey, W. H. "Recent Discoveries at the Temple, London." Archaeologia XCV (1953): 123-134. Print. Lankester, Philip J. "The Thirteenth-Century Effigies in the Temple Church." Temple Church in London. Eds. R. Griffith-Jones & D. Park. Woodbridge: Boydell P, 2010. 93-134. Print. Loftie, William John. Inns of Court and Chancery. new ed. London: Seeley & Co., Ltd., 1895. Print. Lundwell, Sten. "The Knights with the Crossed Legs." Formae (1960): 94-102. Print. Monasticon Anglicanum. Eds. William Dugdale, John Caley, Roger Dodsworth, Henry Ellis, John Stevens, Bukeley Bandinel, and Richard Taylor. 8 vols. London: Longman, Hurst, Rees, Orme, & Brown, 1817-1830. Print. Monumental Effigies of Great Britain. Drawn & etched. Thomas Hollis & George Hollis. June 1, 1840; September 1, 1840. London: J. B. Nichols, 1840. Print. Park, David. "Medieval Burials and Monuments." Temple Church in London. Eds. R. Griffith-Jones & D. Park. Woodbridge: Boydell P, 2010. 67-92. Print. Prior, Edward and Arthur Gardner. An Account of Medieval Figure-Sculpture in England. Cambridge: Cambridge UP, 1912. Print. Records of the Templars in England in the Twelfth Century: The Inquest of 1185 with Illustrative Charters and Documents. Ed. Beatrice Lees. London: Humphrey Milford, 1935. Print. Richardson, Edward. The Monumental Effigies of the Temple Church. London: Longman, Brown, Green, & Longmans, 1843. Print. Stothard, Charles A. The Monumental Effigies of Great Britain. 1814. Ed. John Hewitt. new ed. London: Chatto & Windus, 1876. Print. Stowe, John. A Survey of the City of London and Westminster. 1603. 1908. 2 vols. Oxford: Clarendon P, 1971. Print. Temple Church London: History, Architecture and Art. Eds. Robin Griffith-Jones & David Park. Woodbridge: Boydell P, 2010. Print. Timms, Brian. "Glover's Rolls." Early Rolls of Arms: European Rolls of Arms of the Thirteenth Century. 7 June 2010. Web. 4 July 2009. Tummers, H. A. Early Secular Effigies in England: The Thirteenth Century. Leiden: E. J. Brill, 1980. Print. Williamson, J. Bruce. The History of the Temple London from the Institution of the Order of the Knights of the Temple to the Close of the Stuart Period. London: John Murray, 1924. Print. Catherine A. Armstrong has Master's degree in Professional Writing from Kennesaw State University in Atlanta, Georgia . Her field is medieval English history. Her specific field is William Marshal, his fiefs and "familiares". Her concentration is on the lands and people bound to Marshal by blood and marriage, by feudal tenure, and by "affinity". She can be reached via e-mail at: seneschal@peoplepc.com. 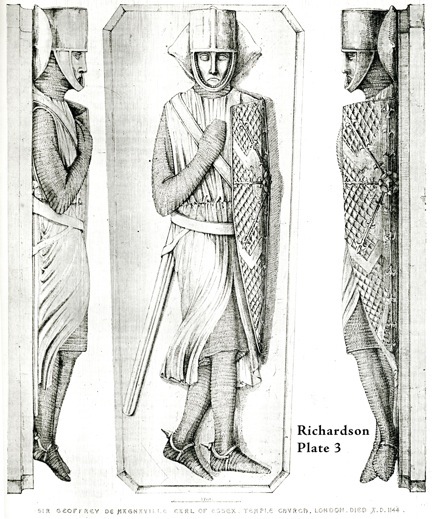 February 2009: "William Marshal, Knights, and Armour." April 2010: "Knights, Tournaments, and Tales of William Marshal." February 2011: "Knights' Templar, Temple Church, and the Military Effigies."